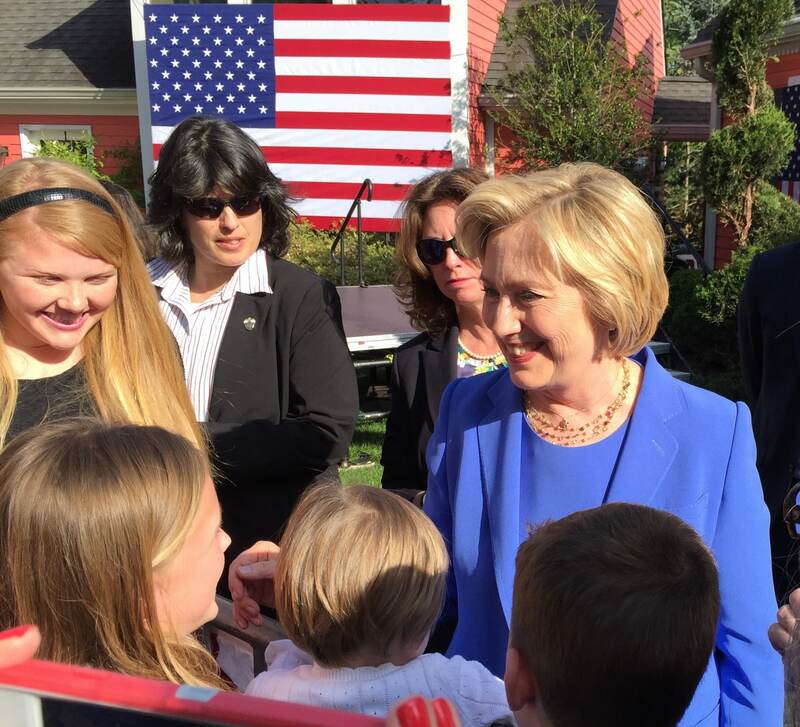 By Kathy Groob, Consultant, Founder ElectWomen – In the final days before the Kentucky Primary Election, Hillary Clinton visited my hometown and I had the opportunity to see her and speak to her for the third time. With only a moment to chat, I wanted my comments to be encouraging and meaningful. I don’t remember exactly what I said, because like everyone in the room I got caught up in the surreal moment of standing next to our next Commander in Chief. I likely spouted off something incoherent – “So proud of you, you are great, love, love, love!” And I found myself wrapped up in watching her interact with other women, and, particularly, with the children who were at the event. Her interaction with these children – many of them children of my dear friends – spoke to what is clearly the heart of a mother and grandmother. I wish everyone could see what I see. Hillary, your strength – your courage—is remarkable. I know what it feels like to put yourself out there, to be vulnerable to others who will cast judgment on veritably every remark you’ve ever made, and examine everything you’ve ever done. I believe in what you want to do for our country and that it is the right path; the right way to make our nation more equitable for everyone. You are a smart and savvy politician and I have no doubt that you will find a path forward for every obstacle that is thrown your way. I trust you Hillary. You have shown us time and time again that you have a spine of steel, that you can handle the pressure and political gamesmanship that is inherent in our thorny political arena. I share your values; that everyone matters, that America is the light of the world and that we must continue to be better and stronger as a nation. I want a battle-tested Commander in Chief. Someone who understands the global stage that we compete and interact with each and every day. I will sleep well at night knowing that you are the one answering the ‘red phone,’ (or the Bat phone, whatever it is called). Are you perfect Hillary? No. Are you the best politician to have ever run for president? Probably not. Do you worry about privacy and have you made mistakes in every position that you have held? Yes. Criminal? No! You pass the test for me. I learned early in my business career, if you are not making mistakes, you are not moving forward. I also believe we learn more of life’s lessons from mistakes rather than from successes. You will succeed because you have a bold vision for our country. You are not afraid to keep trying and yes, you will continue to make some mistakes; I’m ok with that. Keep trying Hillary, to share your ideas and plan for America with us. People are listening and hoping for a better future – one that is fair to all – and that our world will be safe. We have big problems and no one person can solve them all. Continue to tell us what you think, give your straight talk and tell us what we need to do as Americans. I am optimistic that we can make progress here at home and on the global stage for peace, progress and to save our planet. Women are held to higher standards, Hillary. This is proven and holds true with how people are judging you. I know how tough it can be for women. Most of all, I want to say stay strong; feel the arms of the women who support you lifting you up. You are ready to make history. For all of us. You have my admiration, Hillary. My confidence, my trust and my vote. I will be there for you because you are there for us.